Dr. Fung Kai Hung is a medical doctor with specialist qualification in radiology. His special professional interests include interventional radiology, neurointervention and 3D medical visualization. He graduated from the University of Hong Kong, Hong Kong in 1977. Currently he is appointed consultant radiologist in the Pamela Youde Nethersole Eastern Hospital, Hong Kong. He is a self-taught new media artist located in Hong Kong. He uses 3D computed tomography (CT) as his creative medium since 2003. During his involvement in the “Surgical Virtual Reality Laboratory” program of the “Minimal Invasive Surgery Training Center” in his hospital, he researched on the use of color in 3D image rendering of CT scans. He pioneered the development of a “Rainbow Technique” that was published in Leonardo in 2006. This technique utilizes contour lines rendered in rainbow colors to define 3D forms and space. Applying this technique, Dr. Fung won the first place in the 5th International Science & Engineering Visualization Challenge sponsored by Science and National Science Foundation, U.S.A. in 2007. His award winning imagery was honored as one of the “Best Science Photo 2007” and “Top Ten News Photo Galleries 2007” by National Geographic. In 2007, his medical visualization project won gold, silver and bronze awards in different categories in the Hong Kong Information & Communication Technology (ICT) awards sponsored by Hong Kong Government. In 2008, he again won gold and grand awards in the Hong Kong ICT awards. 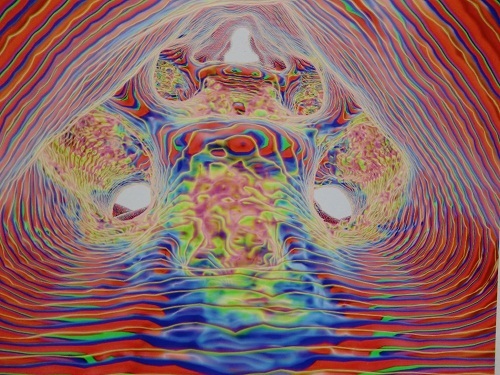 In 2008, he developed 3D and 4D stereoscopic color artworks using CT scans. 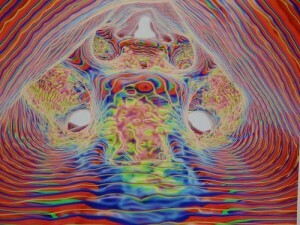 In 2009, he applied 3D & 4D Moiré effect in his color artworks using CT scans. His artworks were featured in over 100 websites and numerous news media and magazines internationally. He is a regular contributor to the “Illuminations” section of the radiology journal RadioGraphics since July 2008. He participated in museum exhibitions in the Hong Kong Museum of Art (Hong Kong) in 2008, in the William Benton Museum of Art, University of Connecticut (Connecticut, U.S.A.) and in the American University Museum, Katzen Arts Center (Washington, U.S.A.) in 2009 and will be exhibiting in the New York Hall of Science (New York, U.S.A.) in 2010. He has an online gallery in the NewScientist website and another online gallery in the Spanish newspaper El mundo salud website in 2009. He is also an active member in establishing an online “Radiology Museum” and an online “Radiology Art Museum” in the “Radiolopolis” community in 2009. He has an online gallery in the “ArtOsphere” community in 2009.